Iraq's strength, ambition, and aggressiveness were for decades a source of regional instability. Saddam Hussein invaded two neighbors (Iran and Kuwait) and oppressed his own population. But now, as Iraq undergoes a transformation to a more open and democratic society, it has become a fragmented country with highly contested politics that opens the door to regional interference and competition. "Iraq, Its Neighbors, and the United States" examines how Iraq's evolving political order affects its complex relationships with its neighbors and the United States. 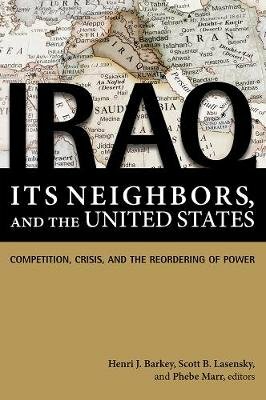 The book depicts a region unbalanced, shaped by new and old tensions, struggling with a classic collective action dilemma, and anxious about Iraq's political future, as well as America's role in the region, all of which suggest trouble ahead absent concerted efforts to promote regional cooperation. In the volume's case studies, acclaimed scholars and experts review Iraq's bilateral relationships with Turkey, Iran, Saudi Arabia, the Gulf Arab States, Syria, and Jordan and explore how Iraq's neighbors could advance the country's transition to security and stability.Stemming from a unique multiyear study and dialogue initiative sponsored by the U.S. Institute of Peace, "Iraq, Its Neighbors, and the United States" also looks at the United States' relations with and long-term strategic interests in Iraq. The volume offers recommendations for how the United States also looks at the United States' relations with and long-term strategic interests in Iraq. The volume offers recommendations for how the United States can help Iraq strengthen and grow.